There are valid reasons to fret about the opening of a new branch of the Victoria and Albert Museum in Dundee. Chief among these is the certainty that museums should be places of enlightenment and education, not high-street brands with expansionist ambitions. When you see a great museum behaving like a branch of McDonald’s, you see an attack on the core of what a museum should be. So I admit to arriving by the Dundee waterside on a grey and blustery day with doubts buzzing like Scottish midges about my head. The V&A in leafy South Kensington is so firmly a London fixture, created for capital reasons, the national home of good design and the decorative arts. Dundee, for its part, is just as firmly a once great northern powerhouse sprawling picturesquely along a Scottish estuary. It isn’t just 500 miles of road that separate one from t’other, it is everything: different past, different geography, different racial memory, different national aspirations, different dreams of the future. The first glimpses of Kengo Kuma’s whopping new riverside building were not especially convincing, either. The celebrated Japanese architect — he is also the designer of the stadium for the Tokyo 2020 Olympics — says he was inspired by the crumbling cliffs and layers of the Scottish coast, but my opening vista of his looming grey whopper had something of the multistorey car park about it, then something of the aircraft carrier. It’s that kind of building — shifting in outline, constantly different, a visual narrative that never properly settles. Only when you complete a full circuit can you appreciate what an adventurous creation it actually is, with its nooks, crannies, tunnels and overhangs. Exactly like a crumbling cliff or a looming rocky stack, the new V&A has a mysterious presence that makes you want to explore it and climb it. Five Go to Dundee, and all that. It’s the same story with the interior. The atmosphere is unfixed. First impressions are very, very woody. You’ve wandered into the world’s biggest sauna, where complicated arrangements of oak slatting climb the walls at strange angles. But then the sheer size of Kuma’s woody cavern begins to assert itself, and your journey up its best feature — a twisty glass and stone staircase, in heroic dimensions, that clings perilously to the cavern wall — is an exciting ascent. As you walk up, the vistas grow bigger and bigger. They also grow lighter and brighter, with unexpected picture windows that open suddenly onto vertiginous views of the River Tay below. Indeed, if this shape-shifting building can be defined by anything concrete, it is the active contrast between its looming and stony exterior and its light and airy interior. The outside says one thing. The inside says another. Even this surprising pattern has natural precedents. What do you get inside looming rocks? Looming caverns. What do you get inside dusty diodes? Spectacular encrustations of crystal. A building, then, unlike any other in Britain, whose animist relationship to nature is tangibly Japanese, but whose bold coastal towering is specifically Scottish and stern. The Shinto thing with nature is in tune with the times. So too are the Scottish flavours. And, just as Kuma’s mobile architecture seduces you with its growing sense of purpose, so the collection it houses seems to enlarge in relevance as you explore it. There are two exhibition spaces in the bright and roomy upper cavern. 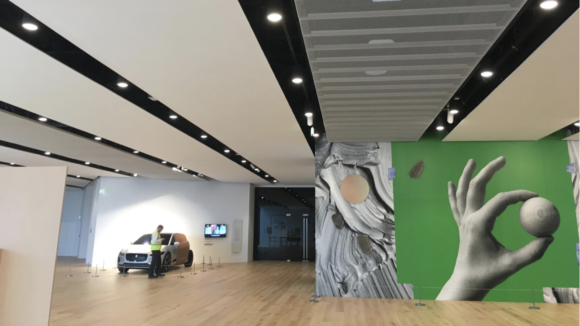 The larger one is reserved for ambitious touring shows — at nearly 12,000 sq ft, it is the largest temporary exhibition space in Scotland — while the smaller one houses a display devoted to Scottish design, its textures, origins and stars. It is this latter space that glues the project together, gives it its unshakable raison d’être and absolves it of all accusations of franchise expansion. The deal here is that the V&A in London supplies most of the exhibits for the Dundee displays, with a few handy additions lent by other museums. In the main, these are not things that are usually on view in South Kensington. But neither are they substitute objects of lesser quality, brought off the bench for a cup game in Scotland. 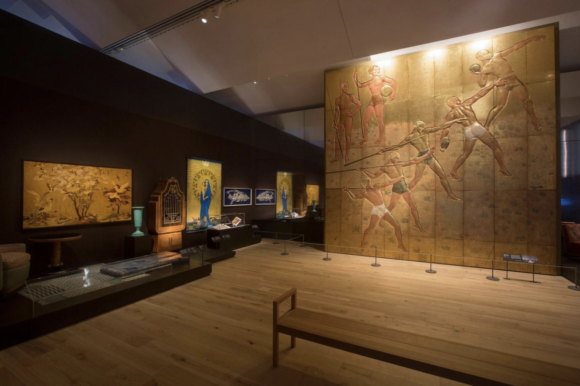 Gathered from scattered corners of the V&A’s holdings, these noisy exhibits have never previously been encouraged to tell their rousing story. It’s a story that dwells longer on ingenuity than on masterpieces. Did you know that Scotland played a critical role in the history of swimsuit design, and that Speedos were a Scottish invention? Of course you didn’t. We might remember that Thomas Telford, the great Victorian road engineer, was Scottish, but I doubt many of us would be pressing the buzzer and yelling “Edinburgh” when asked by Jeremy Paxman where Hunter wellingtons were created. The display that tells us all this is compact and engrossing. 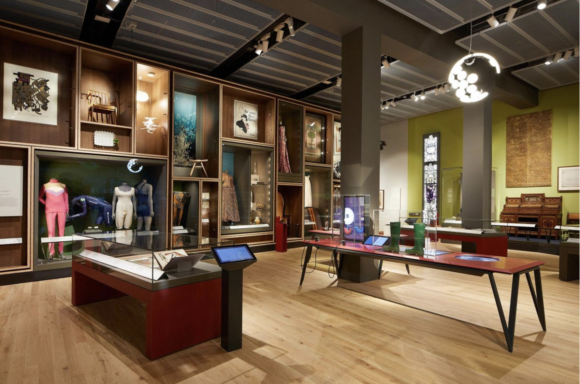 And, because its task is to dash through 1,000 years of Scottish design history, it remains constantly surprising, shifting briskly from haute couture to bridge-building, from porcelain to firearms, from iron balconies to Orkney chairs. It is also mercifully free of the tartan and claymore jingoism that blights so much contemporary discussion of Scottishness, and which makes walking up the Royal Mile, in Edinburgh, such a grim experience. What is being celebrated here isn’t a phoney, tacked-on tartan, but a deep and intuitive design contribution, characterised by invention, adaptability and an international outlook. The stars of this display, the towering geniuses of Scottish design, are travellers and searchers. Christopher Dresser, to my eyes the most inventive commercial designer Britain has ever produced, grew up in Glasgow, but learnt his preternatural minimalism in Japan. Robert Adam, from Kirkcaldy — represented here by a slab of his spectacularly ornate glass drawing room from Northumberland House, on the Strand — studied neoclassicism in Rome before reinventing it in London. It’s a dazzling national contribution, with a hunger for international inquiry that culminates in the handiwork of Charles Rennie Mackintosh. The centrepiece of the new Scottish galleries is a complete Mackintosh interior, the largest room of Miss Cranston’s Ingram Street Tearooms, in Glasgow, designed in 1907. Dismantled when the tearooms were finally abandoned in 1971, the entire space has now been painstakingly restored. With its delicate bentwood brackets, its glowing pink glass, its subfusc electric lighting, its low-slung forest atmosphere, it’s a genuinely magical interior. And the Shintoish note it strikes with its fusion of dark natural forms and cutting-edge modern moments was inspired, so perfectly, so pertinently, by Mackintosh’s fascination with Japanese interiors. 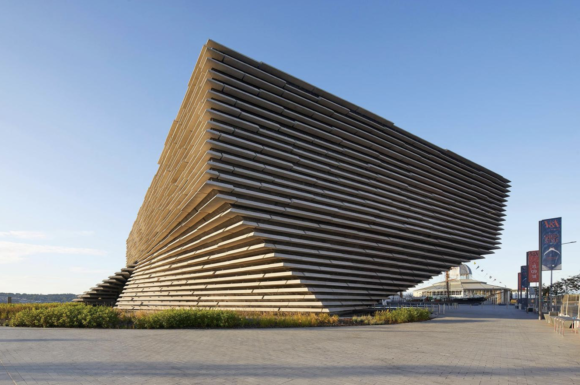 Until now, Kengo Kuma, who travelled to Scotland in his formative years to study Mackintosh, has not put a foot wrong in his Dundee V&A. But the generous square footage devoted to the tearoom pushes everything that follows into cramped spaces that are little more than corridors. And, back in the roomy expanses of the upper cavern, some of the views through some of the windows are so overtly quotidian — building sites, electric cabling, a messy high street — that they destroy the haiku moods. Nor was I much impressed by the mural commissioned from the local artist Ciara Phillips for the big entrance wall upstairs. With its derivative giant brushstrokes, à la Roy Lichtenstein, and confused skipping between figuration and abstraction, it’s a petit maître moment suffering from some serious overpromotion. 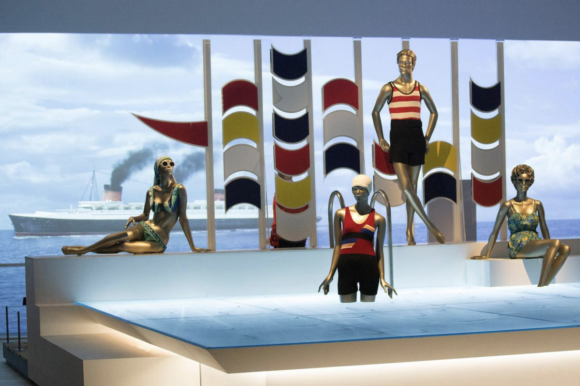 Fortunately, riding to the rescue are the huge exhibition spaces that complete the top floor, currently featuring a fabulous show investigating the crazy worlds within a world better known as transatlantic ocean liners. The Queen Mary, Queen Elizabeth, Lusitania, Titanic: all these floating Las Vegases were a winning mix of uncontained tackiness and bottomless design accounts. The show celebrating them started out at the V&A in London, but it looks better here, and those surprising glimpses of the Tay we had climbing up the perilous staircase add a visceral punch to the great storylines of the great liners. So, welcome, the V&A Dundee. You’ve got nearly everything right. And that’s rare.